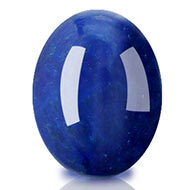 Lapis Lazuli is one of the rarest semi-precious stones in all of gemmology. It's unforgettable because of its typical shade of dark blue: a colour that was so famous throughout the ages that before the evolution of modern paint, this stone was used to produce the ultramarine blue present in a lot of classical paintings. It basically consists of an aluminium silicate, with trace amounts of calcite and pyrite. 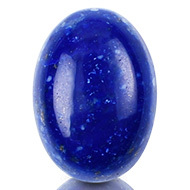 Lapis lazuli Gemstones was historically discovered in Afghanistan and kingdoms from Egypt to Siberia and even the Mughal Empire was very fond of the stone; it was a prized ingredient in many architecture and paintings, including the Taj Mahal. It was also an item of ancient jewellery - amulets, pendants and many other ornaments. 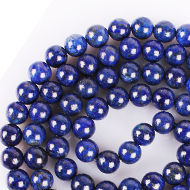 Originating at a host of places, few of the places where Lapis Lazuli gemstones are found in current times are Afghanistan, Siberia and several other parts of the world. 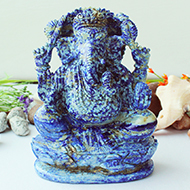 In Vedic astrology, Lapis Lazuli is ruled by Jupiter. It is the largest planet and causes expansiveness of consciousness and gives Raj Yog (kingly luck and abundance). Jupiter is the Guru or teacher and is spiritually and astrologically very strong. If placed in the proper zodiac sign and house, it surely bestows you with tremendous wisdom, wealth, success and fame. When placed in a malefic condition, it gives diseases, misfortune, enemies and losses in career. 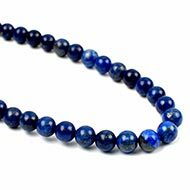 To pacify the malefic effects of Jupiter, one may wear Lapis Lazuli. 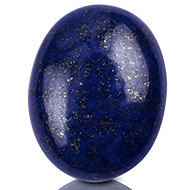 Lapis Lazuli is also known for its shine and it is still used as a polish for boxes, vases and jewellery. Other interesting uses of ancient times were as eyeshade by women and even as inscriptions for famous texts on Gemstones. O When worn as a stone, ring, pendant or bracelet, Lapis lazuli Gemstones helps provide good expression and communication to wearer. 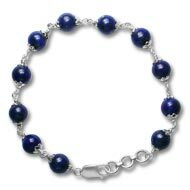 O People who are usually aggressive should wear the Lapis lazuli Stone. O It helps reduce insecurity and anxiety. O It's beneficial to the eyes and vocal chords. Neeta Singhal’s Rudraksha Ratna Science Therapy® (RRST®) applies the use of both Lapis Lazuli gems and Rudraksha beads to balance your chakras. In RRST only natural and non-treated gemstones are used. The Rudraksha Ratna Science Therapy® works on chakras and heals you from within, bearing no side effects. In RRST a gemstone is set as a ring or pendent, the bhasm made of the planetary herb is kept inside one tube and a metal that improves the planetary effects is kept in the other tube. In case of Lapis Lazuli, Asthwat Bhasm and gold are used to attract the cosmic power of Jupiter. The gemstone is then energized with its precise seed mantra on a specific day to empower it to eliminate all the malefic effects of the planet and reinforce its beneficial effects. Thus the gemstone becomes a powerful talisman suitable to be worn by any person irrespective of his birth chart. Situated at the throat region above collarbone, Vishuddha chakra (Throat Chakra) is connected with both hearing and listening, serving as the cleansing point of the body. In the ancient Chakra science, it is the Chakra that is the seat of wisdom, willpower, and ability to make the right choice. 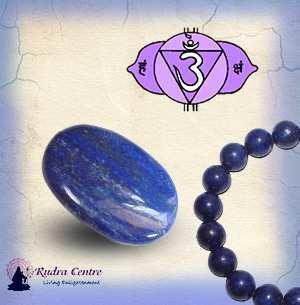 If a person expresses his desire and vision clearly or vividly, his Vishuddha Chakra is optimally balanced and active. A person with a balanced Vishuddha Chakra exhibits resonance, clarity of thoughts and excellent decision making. An imbalance in this Chakra invites thyroid disorders, backache and immunity illnesses. 1. Your gemstone might routinely carry negative energies, and the stone or ring can be detoxified by dipping it in water overnight and placing in a bowl full of quartz crystals for another night. 2. The gemstone can be washed in a thin stream of running water, after which it can be wiped lightly with a soft cloth. It could be polished every once in a while. O Anyone seeking to come out of a depressing emotion or time may wear this because it is the stone of freedom and truth. O It enhances the intellectual abilities and memory. Therefore it is best for the students or anyone doing higher studies. 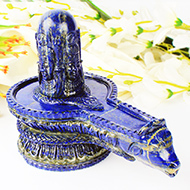 O Those inclined toward yoga, meditation, health exercises may wear this stone for renewed spirit and vigour. O Best for the journalists and psychologist because this stone enhances the ability to research and discern a deep-rooted issue. O If you are unable to control your anger or temper, you may consider wearing this stone. During consultation, the blocked chakras that are causing the mental, emotional and physical issues are identified and limiting beliefs are addressed. Chakras become imbalanced when your thoughts and attitudes tend towards fears and negativity when one is facing challenging situations in life. Blocked Chakras manifest emotional disorders and physical ailments. It is only after blocked Chakras are balanced and activated that you can transform your life of suffering, obstacles, and confusions into love, success, and happiness. As per the chakra status and concerns of the client, a suitable combination of Gemstone and Rudraksha bead is recommended. As per the cosmic colour they emit, the gemstones work on specific chakras. So Lapis Lazuli works on Vishudha Chakra and the RRST Consultant identifies the correct finger position for drawing maximum energy from the stone. Rudraksha and Gems are powerful agents of energy and work on releasing the negative energy stored in the form of stress in the blocked chakras, thereby activating them and tuning them to their natural state. It can be worn on Thursday in the morning after bath. If need be, one may additionally chant the seed mantra “HAM” 108 times before wearing.